We rely on facial expressions so much in everyday life, especially in theatre. 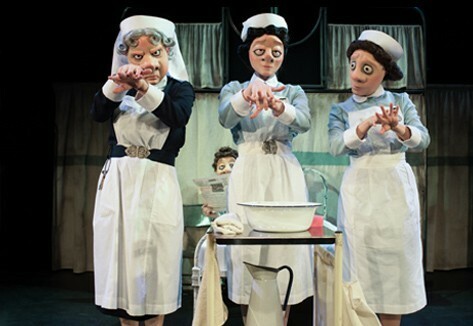 ‘Nursing Lives’ by Vamos is very different, as the play as performed using only mask & without words. The key essence of our characters is perceived through the face, so when it is covered our eyes are drawn to small theatrical devices & details to give expression & meaning. From a small tilt, even to the way you stand, everything signifies so much. ‘Nursing Lives’ follows the protagonist pensioner Flo, visiting the derelict wartime hospital she trained at, however finding the builders are getting ready to demolish it. Through her time wandering the wards, she encounters memories from her past & the audience is transported back to her former life. Focussing on the nurses role in the war, the performance is often funny. However there are elements of sadness; when you really feel for the characters. The beauty of the performance is it achieves this, through the cast tackling the logistical and expressive challenges. What I really admired was the sensitivity to the characters & the subject, making the performance very inspiring.